The American dog tick gets its name from the fact that adult ticks prefer domestic dogs as hosts, and this tick species is only found in North America. The American dog tick can spread diseases such as Rocky Mountain spotted fever. It is thought that American dog ticks are attracted by the scent of animals, so they are common along roads and trails. Adult American dog ticks prefer to bite domestic dogs and can therefore be brought into the home and potentially transferred to humans. In order to help prevent American dog tick bites from spreading disease, wear long sleeved shirts and pants, preferably light colored so ticks will be easy to detect. Tuck pants into socks, and use a tick repellent when outside. To get rid of ticks and limit risks indoors, inspect clothing and skin when heading inside. Wash clothes immediately. If an American dog tick is found on the body, use fine-tipped tweezers to grasp it as close to the skin’s surface as possible. Pull upward with steady, even pressure. Don’t twist or jerk the tick as this can cause the mouth-parts to break off and remain in the skin. 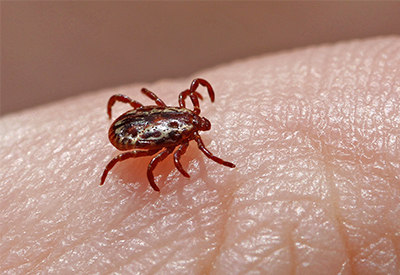 Once the tick is removed, thoroughly clean the bite site with soap and water. Then, flush the tick down the toilet or wrap it in a tissue before disposing in a closed receptacle. Arrest-A-Pest, Inc. has been providing tick control for more than 30 years. If you are concerned about ticks, the disease they can inflict on you or your pet, contact Arrest-A-Pest, Inc. for more information.